With the aim to go green, both LG and Samsung will next week launch prototype of cell phones that would be recharged by solar panels built into the case. The phone by Samsung is dubbed as Blue Earth, which is a touchscreen model with rounded corners developed to look like a well-rounded pebble. Furthermore, keeping in mind the environmentally friendly theme, Samsung has developed the cell phone from recycled plastic excluding all the harmful substances like brominated flame retardants (BFRs), Beryllium and phthalates. 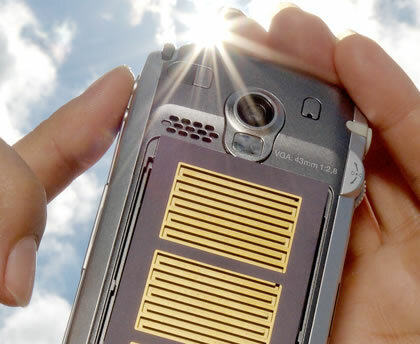 The rear of the phone's case is occupied by the solar cells on the phone. Not much information could be extracted from LG regarding its prototype phone. However, some images released by the company explain that the set would be a version of its KF750 Secret handset. Here again the solar cells would cover the rear of the phone. It should be mentioned here that in both phones that were announced one after another by the companies in South Korea on Friday, not much power is provided by the solar panel to run phone directly and they are used to recharge a conventional battery inside the device. However, the arrival of solar-powered cell phones does not mean that the usage of chargers will come to an end. It was confirmed by Samsung that there cell phone comes with a charger, but it added that it's an energy-efficient one drawing just 30 milliwatts in standby mode. It was also informed by LG that the company might think to commercialize solar-charged phones when they come up with a model that could provide three minutes of talk time after charging for 10 minutes. As far as the launch and pricing for when the prototypes might become commercial models is concerned, it is yet unknown.